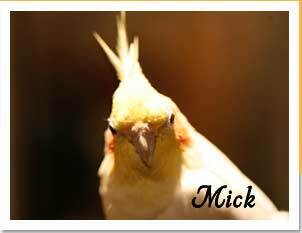 This story celebrates how a lonely bird found its forever place in the heart and home of a Mickaboo volunteer. The story starts in 2006 with an online parrot forum posting about a Severe Macaw in San Diego needing a home. 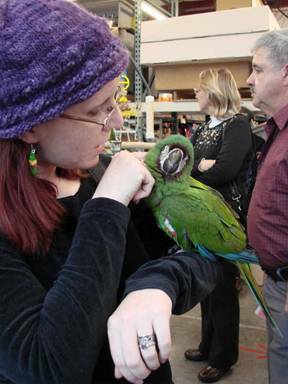 Jody wondered who on earth would give away a macaw, and went to check it out. The bird was living in the garage of a huge house in a high-end gated community. The cage was so small that he had no room to open his wings, no perches, no toys. His food (sunflower seeds) was moldy; his water was dirty. The wife said he was about two years old – the couple had gotten him from a breeder. She said the bird was messy, and loud, and her husband had demanded the bird live in the garage where he wouldn’t bother the family. Jody refused to leave him in such conditions and took him home. She named him Greenbean. Her husband declared Greenbean couldn’t stay (since Jody already had 9 macaws!! ), so she was looking to rehome him. I sent this information to Mickaboo’s leadership and was given permission to bring him into the Mickaboo system – but only if I could find a foster home and get him moved. Thankfully, I had a foster home in the Los Angeles area willing to take him. The foster mom sent me pictures and told me he was a darling bird with no bad habits despite his horrible treatment. He was neither loud nor messy. The vet declared him to be suffering from starvation, extremely low weight, high fat levels in his blood, anemia, and dehydration. Despite his lack of health, he loved to play and would run over to a towel on the floor to wrap himself up in it. Finally the macaw coordinator found him an adopter. The adopter flew from the East Bay to Los Angeles, rented a car, picked up Greenbean, and drove him home. He had another vet visit with full bloodwork, did a six-week quarantine, and then was allowed to meet the adopter’s other macaw. The adopter had hoped the birds could keep each other company; instead, her first macaw tried to kill Greenbean. She didn’t have the resources to let them learn to be friends, and didn’t have the time to give two macaws as much attention as they need individually, so Greenbean came back to Mickaboo. The macaw coordinator asked me again if I could foster. Again, I said no, although I wished I could. “I’m screwed.” was my reply. Another volunteer was there with a camera. He photographed me falling in love (while I was repeating over and over “I’m screwed!”) Eventually the macaw coordinator noticed what was happening and, being a very smart woman, skillfully countered every argument I had against taking him home. In the end I was left with only one argument: my husband Steve wouldn’t let me have him, I was sure. “Um, hi. I have a question ..."
"Um ... can I bring home a macaw?" "Um ... no. Not so much ..."
I had been positive my husband was going to say no; however, he likes to point out I should have known better. He rarely says no to anything I truly want – and he already knew how much I loved this little guy. That said, this dratted bird has been more work than my other seven birds put together. He’s had some huge health issues which have cost us a small fortune (but he’s finally healthy! ), he’s an incredible brat, he IS very loud at times, he keeps trying to eat my heirloom chairs ... and I wouldn’t give him up for the world. He makes me laugh almost daily, is a flirt and a tease, and has a huge vocabulary (mostly things I didn’t try to teach him, while he refuses to say “Don’t eat me!” or “Where’s the rum?!”). He plays peek-a-boo with our cherryhead conure, will do almost anything for an almond, and makes me happiest when he snuggles up to me (upside-down no less) and lets me give him neck skritches. Before Greenbean arrived, I used to say “No. More. Birds!” The universe apparently took that as a challenge, rather than as a directive. 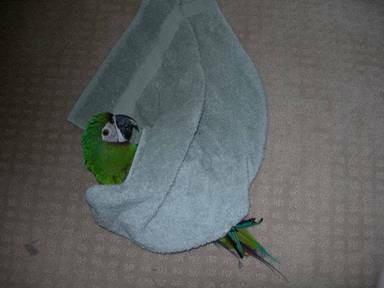 I know now that this was meant to be – the universe knew it, the macaw coordinator apparently knew it, Greenbean definitely knew it. I just needed to find it out for myself! So thank you again, Mickaboo, for letting me bring him into the Mickaboo flock – and from there into my own life and heart.